Most accountants and financial advisors will recommend the fixed 15 year mortgage if the borrower can afford the monthly payment. In most cases, the 15-year mortgage rate is significantly lower than fixed 30-year mortgage rates and by this option naturally eliminates fifteen years of paying interest on a mortgage. The main issue preventing borrowers from choosing the 15 year mortgage is simply affordability. Most homeowners can't afford a 15-year mortgage term, thus the allure of the 30-year mortgage. With "mortgage refinance rates" remaining so affordable, more and more homeowners are considering a fifteen year mortgage for the first time. The 15-year mortgage is not quite as popular with new home buyers, because the short term tends to squash the borrower's purchasing power. The Mortgage Bankers Association pointed out in a recent article that more and more homeowners are refinancing with 15-year mortgages because rates are so low. Think about it just ten years ago most Americans would have been happy with a fixed 30-year loan at 6.5%. So with 15-year mortgage rates falling below 4%, the payments are nearly the same as they were a decade ago on thirty year terms. Home financing has never been this exciting for fifteen year mortgages. People like 15-year home loans because the rates are at record lows and it enables the borrower to own their home outright in 15 years. 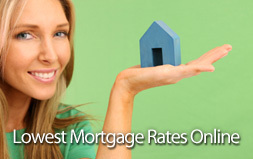 Fifteen year mortgage rates are amortized with equal payments for 180 monthly loan payments. 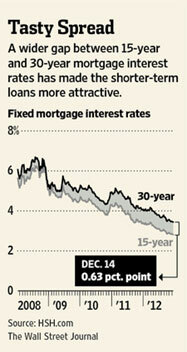 According to Freddie Mac, the fixed 15-year rates fell to 2.625% with half a percent in lending costs dues at closing. Please keep in mind that 15-year mortgage rates are subject to change and pricing can fluctuate based on economic conditions in the market. The Mortgage Bankers Association publishes a weekly report for a Purchase and Refinance Index. This enables consumers to monitor mortgage rates for 15 and 30-year home loan terms. Last week, MBA confirmed when the fixed 15-year mortgage rates dipped below 3% it was the first time they ever dropped that low. Lead Planet Discusses Trends According to the Lead Planet, a mortgage lead generation company from San Diego, the trend for home purchase leads continues to rise. A spokesman for the lead generation company said that most borrowers who qualified for a refinance loan have already locked into a fixed 30 or 15-year mortgage. "The millions of homeowners that haven’t refinanced their adjustable rate mortgage, most likely do not meet the current lending standards for refinancing."